I have used this single line reefing system for the past 20 years, on two different boats, without problems of excessive friction or clashing balance blocks. One person can reef, on almost any point of sail, within one minute without leaving the cockpit. I installed the same system on both boats (Westerly GK29 and Sadler 34) in the original Kemp square-section booms. This arrangement for reefing will not fit into a round boom. Two reefing lines can be accommodated, but the maximum leech length that can be hauled down is only a little more than the boom length. A third reef will have to be set up using a different system. 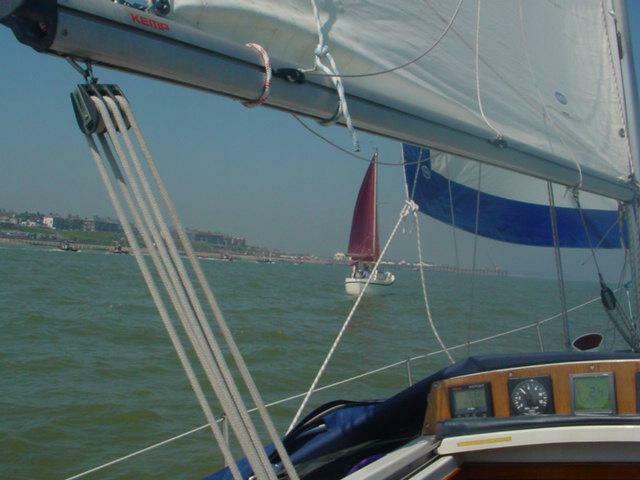 The only additional equipment needed, apart from the rope, is two balance blocks, two additional turning blocks above the boom at the tack, and two fairleads to take the reefing pennant through the boom. Balance blocks, also known as shuttle blocks, are a Seasure item, no.09.60 or 29.60 double block. An alternative is Barton’s double back-to-back blocks, or you can simply shackle two small blocks together. The turning blocks are standard items: mine are simply attached to the tack shackle but they can be riveted to the boom. The fairleads are a Selden standard item known as a slot fitting. The boom needs to be slotted to fit one on each side. Mine are about 100 mm long and 15 mm wide. This is easy to do. Simply drill a 15 mm hole to correspond with each end and join them by cutting with a fine-toothed hacksaw blade. 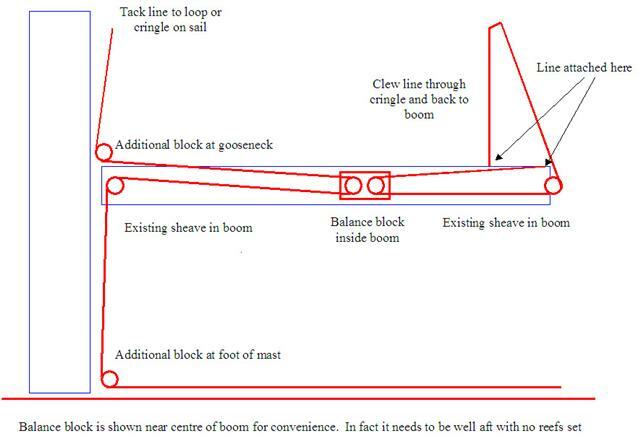 Please note that in the diagram the balance block is shown near the centre of the boom for clarity. In practice it needs to be set well aft when no reefs are set, to enable the system to work efficiently.